We often find ourselves using duct tape outdoors to repair camping equipment and other outdoor gear, so doesn't it just make sense for Gorilla Tape – who boasts about being able to withstand harsh UV rays, cold winters, etc. – to offer their tape in a camouflage variety? Well, that it just what Gorilla did, and it looks like they did it right. If you have ever looked at a hunting supply catalog, you have probably noticed that just about everything they sell is covered in a camo pattern by Mossy Oak, and there is a reason for that, they make the best camo patterns. 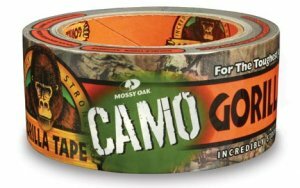 Gorilla chose to use the Break-Up Infinity pattern by Mossy Oak, but unlike regular Gorilla Tape, it features a matte finish. The new camo tape also has the same great features as their regular tape, so you know you are getting something strong, that will stick to almost anything. Gorilla Glue's new Mossy Oak Camouflage Gorilla Tape is available in 1.88-inch width rolls at 12-yard lengths and is available now at Lowe's, Home Depot and other hardware stores. Go out and get your camouflaged on... make yourself a Gorilla Tape ghillie suit.